No Object is an Island: New Dialogues with the Cranbrook Collection is the provocative exhibition that will reopen the expanded and renovated Cranbrook Art Museum at Cranbrook Academy of Art on November 11, 2011. Inside and around the landmark building, designed by renowned Finnish architect Eliel Saarinen, the exhibition will pair the work of 50 leading contemporary artists and designers with an equal number of objects from Cranbrook’s outstanding permanent collection of 20th- and 21st-century art and design. 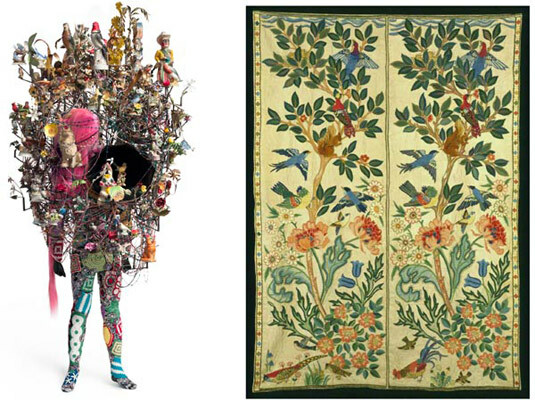 Visitors will discover a Nick Cave Soundsuit side-by-side with a tapestry by Arts and Crafts master May Morris. A conceptual partnership that Maarten Baas projects between himself and Marc Newson meets a very real early collaboration of Eero Saarinen and Charles Eames. And Whitney Biennalist Tony Mattelli’s hyperrealist sculpture, The Hunter, faces off with one of fellow sculptor Kate Clark’s ravishing taxidermy beasts with a human face.